The JUUL Electronic Vapor Cigarette by Ploom may just be the first real GREAT e-cig! Ploom has invested a ton of money and research into developing the first truly satisfying e-cigarette for current smokers. With the right flavor, Juul Starter kit consistency, power and nicotine strength it is the best bet for anyone trying to quit smoking! 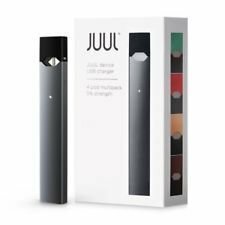 Juul Starter Kit with 4 pods & Charger kit HOW DOES IT WORK?